He’s known locally in Novato, California as the “Man of Many Mysteries”, an intriguing character who seems to have popped right off the pages of a book. But that’s because the stories he concocts are drawn from the many adventures Harold R. Miller experienced as a member of the National Security Agency. Harold joined the army reserves in 1957 after graduating from college with a degree in journalism. In 1962, Hal became active so he could attend the language school in Monterey. There he discovered he and two other men were extremely adept at interpreting Morse code. “There were three of us who were sent to a six-week school (for Morse code training), but it took us only two weeks to complete. All of us were copying five-letter groups, forty-five a minute,” he says. Eventually his superior officer told him and his friends to entertain themselves, so the rest of their time was spent hanging out in coffee shops. After training was over, Hal was assigned to a top secret facility in Okinawa with the National Security Agency. During our conversation, Hal was eager to share his stories, diving right into his most amusing memories. It was as if no time had passed as he recounted everything, from the time a tarantula landed on his mosquito netting, to the exasperation an Okinawa local had when it came to people running from attacking airplanes —you run towards the plane, not away. It was clear that Hal’s time in the agency was not entirely marked by top secret missions and investigations. In fact, he found time to hang out in the local boat yard, crafting a trimaran (a sailboat with a main hull and two smaller outrigger hulls) and becoming close friends with Kosygin, the last member of the royal Ryukyu line and a current member of the Okinawa government body, the Diet. Over the phone, I could hear the hint of a chuckle in Hal’s voice as he told me about his last night in Okinawa. Yacomem, the boat yard guard manager, invited Hal and his friend Bruce Kek over for dinner with Yacomen’s wife and two children. Yacomen treated them to a traditional Japanese meal and then escorted them into another building where they met another wife and another two children. Six hours and four meals later, they had met all four of Yacomen’s wives and their eight children. As dinner came to a close with the fourth wife, Bruce made the brave decision to ask her what she thought of her polygamous marriage. She knew the other women, she pleasantly informed them. They were all friends and their children all attended the same school. After being plied with Sake all evening, the two men were greatly surprised the following morning at 6:30 when they were summoned to the commandant’s headquarters. Still feeling the effects of the sake, they were not in the best of shape and couldn’t stop giggling. “Bruce was the kind of guy who would just look at something and giggle, and of course that would make me laugh,” says Hal. After a few reprimands and an order to pack their things, Hal and Bruce shipped out for 45 days of special training with the Defense Intelligence Agency. There, Hal learned to plant listening devices on buildings and to discover how many members of the Diet wished to repatriate the island to Japan. It was only after a mission to plant listening devices went awry that Hal finally decided he wanted out of the DIA. He was relocated to Belize on Special Assignment, or R&R (rest and recuperation). Once Hal was officially free to go, he started a new career as a private investigator, a career he feels he had since “before Christ was born.” After a visit by Philip Castro, the Chief of Security for the Philippine Airlines in 1983, Hal started his first book, The Philippine File, the closest to reality he has ever written. It prompted him to continue documenting his journeys from The Australian File to The Emerald Head Caper. It wasn’t until he went back to finish The Philippine File that he decided to solidify a series, and thus created the back story for Penn Gwinn, his reigning protagonist in Thai Moon Saloon. Each book is filled with intrigue and adventure, and of course the classic twist and surprise ending. The reality of life in army intelligence divisions cannot be completely outlined in a book or a movie. When prompted about Hal’s views on the media’s fascination with spy movies and unbelievable action sequences, Hal avidly critiqued how phony most of the stories end up being. Those films are merely created to excite young audiences, ones with minimal ability to see through the simulated experiences. After eight years and six months in the agency, Hal decided it was time to walk away. He crafted four boats in his spare time (two of his own design) and accumulated unforgettable adventures and friendships that would lead to stories filled with laughter. As the interview started to wind down, I felt that as much as I had been permitted to hear about his life, there was still so much more to Harold’s story than a mere hour or more could cover. Luckily for me, the rest of Hal’s story can be glimpsed in his action-packed Penn Gwinn series. Although Penn Gwinn may be just a fictional character, his very being is a lens through which the intriguing Harold R. Miller can be viewed. 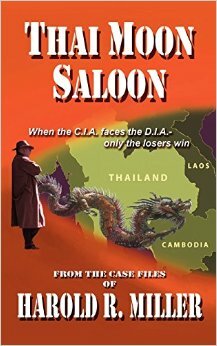 Get your FREE Kindle Version of “Thai Moon Saloon” Friday December 18th Through Tuesday December 22nd! As part of our #DecemberDeals promotion this month, we are happy to announce that we are offering the first book in the Penn Gwinn Series, “Thai Moon Saloon” for FREE on KINDLE from now until Tuesday December 22nd. So if you love action-packed International Intrigue, download a copy of “Thai Moon Saloon” now and get ready for some adventure! About the book: After serving in Vietnam, Penn Gwinn and his combat buddy, Jim Starret, relocate to Bangkok, purchasing a saloon to house their bodies and beleaguered souls. Despite its meager profits, they consider it their “retirement.” Their former involvement with the Defense Intelligence Agency comes back to haunt them, however, when the sister of a dead buddy – a DIA field operative – shows up and demands their help.